From left, Andrew Hardie, Shona Haslam, Michelle Ballantyne and David Mundell at the Leadburn junction. UK Government Scottish secretary David Mundell has voiced disappointment that calls to improve a junction just outside the Borders claimed to be an accident blackspot look set to go unheeded. Dumfriesshire, Clydesdale and Tweeddale MP Mr Mundell had supported an appeal to Midlothian Council by councillors in the Borders to have a roundabout built at the junction of the A701, A703 and A6094 roads north east of West Linton, but that plea was rejected at a meeting last week. He said: “Constituents have contacted me over many years with concerns about Leadburn junction, and the consensus has been that a roundabout is the best solution. Scottish Borders Council has offered help to its northern neighbour to make the junction safer, but that offer is only being taken up conditionally. It remains on the table, however, according to Scottish Borders Council leader Shona Haslam. 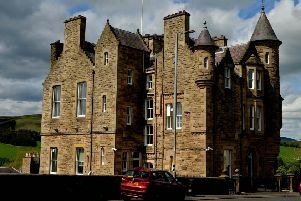 “Scottish Borders Council will continue to push for improvements and stand ready and willing to work with Midlothian Council to find a solution,” said the Tweeddale East councillor. South Scotland Conservative list MSP Michelle Ballantyne, a former Selkirkshire councillor, also hit out at the decision, saying: “Putting a roundabout at the Leadburn junction has been an idea that’s been floated around for many years. Midlothian Council’s decision not to prioritise the junction for improvements followed a claim made at the full meeting of the authority held last Tuesday that no fatal crashes not caused intentionally had been recorded there in recent years. Penicuik councillor Joe Wallace said: “There have been no tragic accidents at the Leadburn junction itself. His claim went unchallenged in the chamber as councillors debated a motion by fellow Penicuik councillor Andrew Hardie urging Midlothian Council to work with its southern neighbour to carry out safety improvements. Mr Hardie’s motion urged the council to reconsider having a roundabout built, saying that had been agreed over a decade ago but subsequently put on hold due to lack of funds. Mr Wallace was among those opposed to any such co-operation, saying: “ The hypocrisy of Scottish Borders Council shows no bounds here. “We approached them four or five years ago asking them to collaborate with Midlothian Council to help with this junction, and they refused to engage with us. Members voted against Mr Hardie’s motion by 12 to two, instead backing an amended version by Midlothian East councillor John Hackett agreeing to engage with Scottish Borders Council but refusing to consider a roundabout, replacing that suggestion with what he described only as “possible solutions”. The amended motion also calls for the “professional opinion of officers as to the priority of this junction measured against other road safety issues in the county” to be sought. Following the meeting, Mr Hardie said: “I’m disappointed that Labour and the Scottish National Party chose to defeat this motion. It is estimated that about 11,000 vehicles use the junction daily, many of them travelling to or from the Borders. In 2005, a motorist died after he crashed into the historic Leadburn Inn at the junction, causing a fire which destroyed the original 242-year-old inn. According to council statistics, there had only been one serious injury crash and two less serious ones over the three-year period to last April. In 2010, however, a pensioner died in a two-vehicle collision at the junction, and the following year, a four-car pile-up left a woman with spinal injuries. The deaths of two people in a crash near the junction in 2016 were ruled by police not to have been connected to the road’s layout, though.